Today’s the opening day our of TechCrunch Disrupt conference, and we’re starting it off with a bang. Famed interviewer/journalist/host Charlie Rose is talking to John Doerr, partner at venture capital firm Kleiner Perkins Caufield & Byers. Doerr is known for his massively successful investments in companies such as Google, Amazon, Intuit, and more recently Zynga (among many others). Rose asked Doerr for his thoughts about what’s coming next. Doerr says that’s we’re on the third great wave of innovation. The first was the microchip/PC in the 80s. The second was the Internet in the 90s. And now we’re entering a wave of social, mobile, and new commerce, Doerr says. And what’s leading that wave? The iPad. Doerr (who invested in Apple) clearly loves this device. He had one on stage with him and kept picking it up over and over again throughout the Internet. He says it will change the way we interact with everyday things such as television. And it will charge health care. But maybe most importantly, it will change education, he says. Rose also asked Doerr about Facebook. He asked if there will be other social networks that rise, or if Facebook will rule them all. Doerr isn’t sure. He thinks there could be a federation, or that Facebook could be the one. That said, he does consider Facebook to be one of the “four horsemen” of the Internet right now. According to him, those are: Facebook, Google, Amazon, Apple — yes, all Kleiner Perkins investments. Branching off from Facebook, Zynga, another Kleiner Perkins investment, is the fastest growing investment that Kleiner has ever made, Doerr says. He believes they’ve nailed the mixture of social with a business model. It isn’t just about advertising, it’s about virtual goods. And they’ve used it for good too – to raise millions for Haiti. Rose asked Doerr what worries him the most right now. Doerr is worried about energy. Specifically, he’s worried that he U.S. if falling too far behind in energy technology. We may dominate the web, but other countries dominate the future of energy right now, and we’re going to be buying our future from them unless this changes, he reasons. Charlie Rose: I come to this area as a laymen. But I’ve talked to a lot of people in the space. Recently Mark Pincus of Zynga. Steve Jobs did a program with me a while ago, even before he was Steve Jobs. 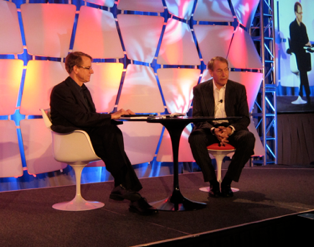 John Doerr and I got to know each other in the 90s. Now we’re friends. Where are we in the revolution? What comes next? This third wave is social, mobile, new commerce. We don’t have a name for it yet. We could be on the verge of reinventing the web. It’s people, it’s places, it’s relationships. It’s exciting. CR: What will influence its velocity. JD: One key thing is apps. Steve Jobs has transformed everything. It’s turning this world upside down. CR: In the first hour with the iPhone and app, you were in right? You knew. JD: I did. These smartphones change everything. They’re always connected, always on. It’s a powerful new platform. 85 million iPhones and iPod touches – we’re there. And now we have the iPad. It took just 28 days to sell a million of them. It’s not a big iPod. It’s a new paradigm. Imagine 10 years forward. CR: Go ahead take 10 years forward. Steve Jobs told you “this is the best work of my life.” Why does he think that? JD: It’s not a computer. You don’t need files. You don’t need mice. It’s magic, what you see is what you touch. I don’t want to call it a computer. It’s a magical surface. CR: You own Apple stock. JD: Regrettably (laughing). We raise $100 million iFund 14 companies from 5,000 that applied. This year those ventures will do $100 million in revenues. 80 million minutes a day in those applications. In 14 months we ran out of money. So we went back to the piggy bank to get another $100 million. CR: What’s with Steve an Adobe? JD: He has a note on his site about it? Flash is buggy and power problems. The iPad runs for 10 hours. CR: Is battery improvement coming? JD: No, it’s coming really slowly. There are some disruptive things, but it’s coming slow. CR: What else does the iPad need to make it better? JD: There’s the obvious things like a camera. It will be 5 times as fast, a terabyte of storage. And that’s just a few years from now. It won’t have a phone in it. CR: What does Mark Pincus and others like Zuckerberg have in common with some of the greats? JD: They were nerds. They had no social life whatsoever. They have a love affair with their companies. They were missionaries not mercenaries. CR: Bill Gates was more Rockafeller then Edison. JD: They’re passionate about product. It’s the most important thing. CR: Talk about Kleiner Perkins. Some investments are successful, some are not. Talk about Zynga. JD: We invested in Zynga 20 months ago, and it’s the fastest growing venture we’ve ever had. The people there are extraordinary. They can monetize these new social networks. Advertising is one part, but it’s more than that. 2% will pay for virtual goods. They also raised $3.6 million for Haiti in just a few days. It’s powerful stuff. In any day there are 30 million people playing Farmville — that’s more than watch 60 minutes. CR: So what can you do with that? JD: A lot. There’s not branded place on the Internet right now to have fun. It’s about life. They become a habit that connects you. CR: Is the core of the third wave the convergence of social and mobile? JD: That’s at the core, but it’s changes in consumer behavior. New commerce is included. Mark Pincus’ wife Ally has a company called One King’s Land, there they find limited sale — you better get it now. It’s an idea. CR: Social networking is an old idea, that Facebook brought into the future. Will there be one? JD: That’s an interesting question. I don’t know. There may be one, or there may be a federation. CR: What does your history tell you? JD: It tells us that one of the key to all of this is network effects. When you have 500 million people and you square that — it’s a huge number. CR: Will there be more? JD: I don’t know. Let’s see. CR: Let’s talk about media. What about Google TV? JD: It’s the best version of what it is that I’ve seen. For the last time we’ve watched the Super Bowl with out the Internet in your lap or on the screen. The Internet are finally coming together. CR: Let’s talk about China. JD: They now have more Internet users than we do. They’ve been ahead in user pay. But Google is leaving the mainland, the state is soverign. The leading players are Chinese companies. It’s a tough market for Western Companies. CR: What does that mean for Google? JD: (pauses) Google takes a very principled point of view. You can’t buy position in their network, for example. For a state to not let things be ranked automatically didn’t work. They stepped away from the largest market. Google, Apple, Amazon and Facebook are the Four Horsemen of the Internet. Each of those have huge market and can innovate. CR: What’s disruptive looking down the pipe? JD: I haven’t talked about new immersive relationship between you and the medium. Again, I’m not talking about computers. It’s like the iPad. This is a fluid experience. New ways of interacting, things from Apple, Cooliris, there are others. These will improve. We’ll look back at these devices today as if it’s the stone age. I’m excited about what the iPad can do with healthcare. The government is spending $20 billion on this. We need this information in the cloud. Every doctor and nurse needs an iPad. CR: But someone has to teach the doctors how to do this, right? They’re too busy. JD: Sure. Another thing is education. This tablet will transform education. CR: But the potential in schools hasn’t taken place yet, right? But this will do it? CR: Russia wants to create a Silicon Valley — so does China. JD: I talked to one of the Russian guys behind this. He said it’s not going to work — because it’s hard. CR: What excites you about the future — where are we missing something? What worries you? JD: My worry isn’t about innovation in tech — the iPad is transforming things. But I worry about energy. We continue to spend too much money overseas, and we’re hurting the environment. The U.S. was the leader in the Internet. But in new energy tech, 4 of the top 30 in new green tech re in the U.S. It’s like if Microsoft, Apple, Google, Facebook were all outside the U.S. Only Amazon would be American. We have to get in this game. Or we’ll be buying our energy from the world. That worries me.